When it comes to a successful hunting trip, there’s nothing more important than choosing the best hunting rifle. Whether you’re heading out for the first time or the fiftieth, it’s all about choosing a rifle that fits your hunting style and the game that you’re pursuing. We build and repair a lot of awesome hunting rifles here at the Colorado School of Trades. 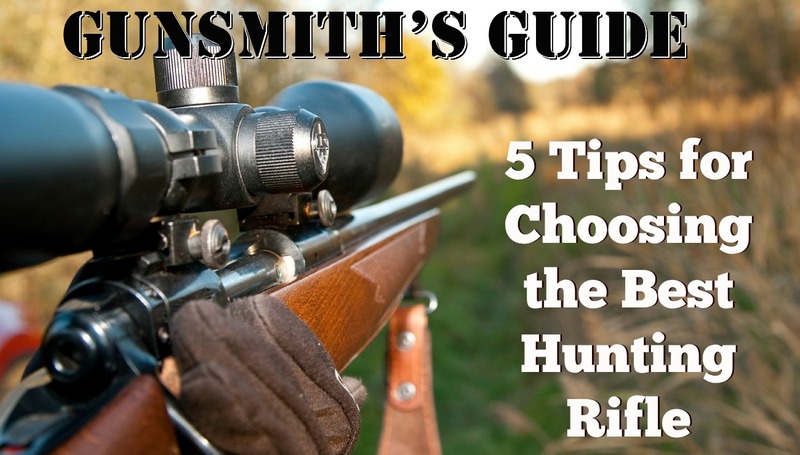 Here’s a quick primer of what we consider when we’re looking for a hunting rifle. Buying a hunting rifle means doing research and reading hunting rifle reviews before you head out to shop. Decide which models you’d like to look at, then read up on them. Consult manufacturer websites and online forums. Use other information sources as well. Talk to knowledgeable friends or ask a gunsmith you trust if he has any opinions about a particular rifle. Trust me, he will! The rifle cartridge, which many people simply call the bullet, is central to any hunting trip. It’s also central to any hunting rifle. Remember that every gun is designed to shoot only certain cartridges. You’ll need to think ahead if you’re going to be hunting very large game, as you may need a rifle you won’t find in a basic hunting collection. If you’re new to hunting or are looking for a basic hunting setup, consider a gun that’s designed to shoot a .30-06 Springfield, .308 Winchester or .270 Winchester. For small game and varmints, many hunters go with a basic .22 or .223 Remington. Choose a cartridge that has enough power to take down your game with a single shot. The rifle action is responsible for kicking out fired cartridges and loading new cartridges into a rifle’s chamber. When it comes to actions, hunting rifles are designed to fire either single shots or repeat shots. Choosing the right type of action is largely a matter of preference. Some hunters like single-shot rifles, which increase the pressure to make an accurate shot the first time. Others prefer repeating rifles, which decrease pressure and are an ideal choice for newer hunters. Single-shot choices include rolling-block, break-open, trapdoor and falling-block action rifles. Repeating choices include pump-action, bolt-action, lever-action and automatic rifles. You’ll only be able to determine which is best for you by spending some hands-on time with different rifles. You’ll find hunting rifles at a variety of price points, which is good news. However, it’s essential to know what sets the good-but-affordable rifles apart from the just-plain-cheap rifles. You can avoid a bad investment by choosing the right barrel and stock materials. Most hunting rifles feature either stainless steel or carbon steel for the barrel and other metal components. Carbon steel is cheaper, but it’s more prone to rust than stainless steel. If you keep up on regular rifle maintenance, this shouldn’t be a deal breaker. In terms of the stock, you’ll likely be able to choose from wood or fiberglass. Both are good choices so long as they’re well maintained. When it comes to wood, it’s also important that you choose a good species. Stocks made from materials such as walnut may be more expensive than other wood choices, but they’re also more durable. Many a hunter has fallen into the trap of buying a great rifle and then having no money left for a rifle scope. Think ahead and budget for your optics so that you’re not stuck with a rifle you can’t use. In terms of budgeting, you can plan to spend between 50 and 100 percent of what you spent on your rifle on a scope. If you already have a suitable scope, remember to mount it, site it and get comfortable with it before you head out to hunt. Working with a trained gunsmith is the best way to find the hunting rifle that fits your every need. The skilled gunsmiths at the Colorado School of Trades can help provide you the education you need to become a gunsmith who is capable of building the perfect hunting rig, too. Reloading Ammo vs. Buying Ammo – Cost Saver or Time Waster? Thinking of becoming a gunsmith? Why wait? Fill out the form below to receive more CST Information. How did you hear about the Colorado School of Trades? Are you requesting information on behalf of someone else? Clicking the "Request Info" button constitutes your express written consent for Colorado School of Trades to call and/or text you at the number you provided, regarding furthering your education. You understand that these calls may be generated using an automated technology.